Over 50 members participated in the Anacortes Yacht Club’s annual Fall cruise to Deer Harbor. The flotilla consisted of sixteen boats with a mix of both sail and power. 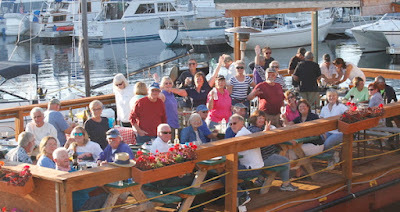 Cruise Captains, Tom and Anita Nute and Bob and Bernie Bell organized lots of fun and games to entertain the members. The weather was perfect for on the water activities like ‘Aqua Golf’ and kayaking. On-shore there was the renowned wine, chocolate and cheese tasting and potluck bbq. Winners of the Duck Luge were the all female team of Helen Prier and Karen Thomson. They beat out tough competition but going into the final round Helen said “ I feel quietly confident” while Karen claimed “I’m stoked!”.